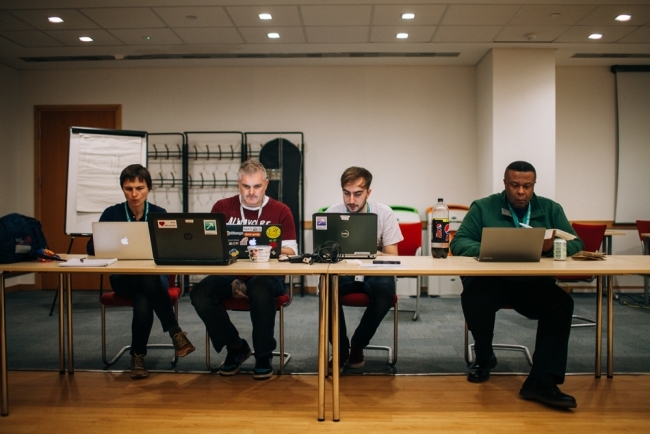 Earlier this month, DfT ran its second Hack Club event, where prototype services are built from scratch in double quick time. The concept of hacking, hackathons and hack clubs is less nefarious than its name would suggest. It's a method by which digitally skilled people come together and try to ‘hack’ solutions to problems or challenges set. The ideal is to create working prototypes or products as opposed to presentations where you just outline potential solutions. Unlike many movie sequels, Hack Club 2 proved the equal to the original and in many ways surpassed its predecessor. The first Hack Club was a success in identifying coders, programmers, designers and others in the department with a curious and inventive attitude. Hack Club 2 aimed to build on that success by producing working prototypes in just 2 days in response to real life challenges. The assembled hackers embarked upon a variety of challenges. These ranged from a tool to help with statistical analysis to examining the potential uses for the shipping data we collect. Within an hour, teams had formed naturally, with people gravitating towards the challenges that interested them most or fitted their skillset. Post-it notes and flipcharts were scribbled upon, and potential solutions were explored until an MVP (Minimum Viable Product) was decided for each group. By the end of day 1, all groups had identified their MVP and had begun coding furiously, either using the department’s own data or ‘hustling’ (using your connections and influence) to find and use other data. All the groups worked frantically right until the last minute before the Dragon’s Den of judges (Richard Bruce, Nic Cary and Emma Campbell) fixed them with a steely stare ready to be convinced. Team Quotanator were up first with their solution for identifying the most appropriate method of sampling to use in a statistical analysis. Using the GOV.UK prototyping kit, they built a decision making tool which identified which type of sampling you should or could use in different scenarios. From sampling we moved to Mapar (Maritime Protection and Response). 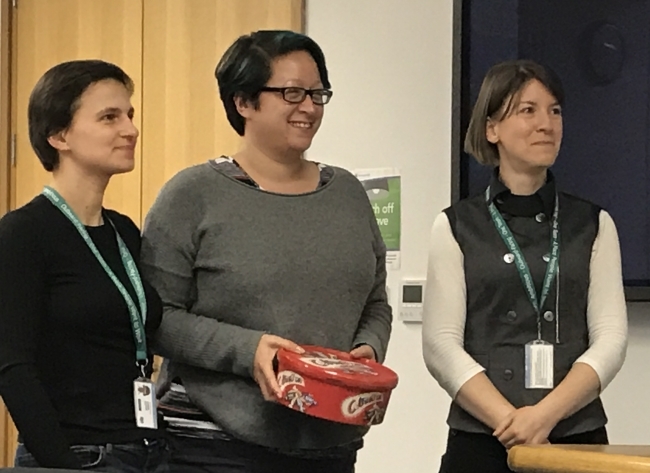 This team asked the audience to envisage a situation where you are on duty in the department’s emergency response room and urgently require up-to-date information about a particular ship’s position and status. This solution provided a one-stop shop website using real-time data from the ship’s onboard AIS tracking system. Still on the maritime theme, the Treasure Chest team pitched a visualisation of the most financially important shipping routes - especially helpful for estimating the effect that any future route changes could have. Next up was an interface which enabled enhanced graphical representations of historic traffic data – another useful tool seeking to improve the user experience. 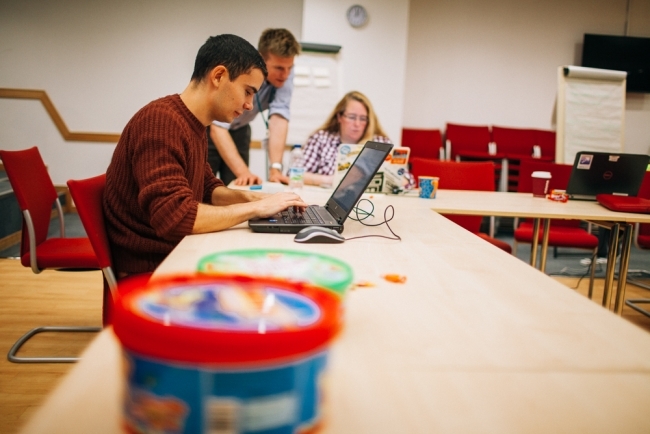 Transport modeller David Pavitt took the Coding Genius award for his innovative use of code. This prototype also showcased our Corporate Systems team leader Sarah Baskerville’s mastery of the free data visualisation product, Power BI. And finally a light-hearted solution – Awkward Coffee Date. A response to a random coffee generator challenge, this app brings random people together to share thoughts and skills and potentially create new solutions to business challenges. An important thing about Hack Club is that it is not just for those with coding skills. Presenters, hustlers, those with research skills all play a part in generating the prototype and pitching it to the judges. Indeed, those whose pitch focuses on ‘showing the code’ instead of the product often fail to impress. It's the mix of abilities and skills that leads to a successful hack. The judges were impressed with these genuine solutions to departmental challenges and we are all looking forward to Hack Club 3, due to hit our screens in Spring 2017. It was an awesome day. Great to be around folks curious and inquisitive folks who wanted to see if they could help solve real problems. Looking forward to the next one already! Thanks for this Sarah and for the wealth of links and supporting detail sitting behind the Hack you were involved in.